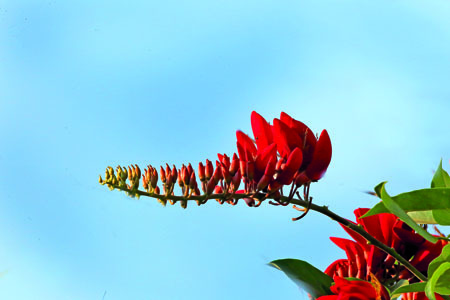 The scarlet Erabadu flowers in full bloom during the season of Avurudu are an unmistakable metaphor of the festival. From the image of the Asian Koel (Koha) singing its melodious songs sitting on a Erabadu branch to the crimson Erabadu flowers emanating the bright shades of the sun, Erabadu tree is one of the most prominent natural signatures of Avurudu. 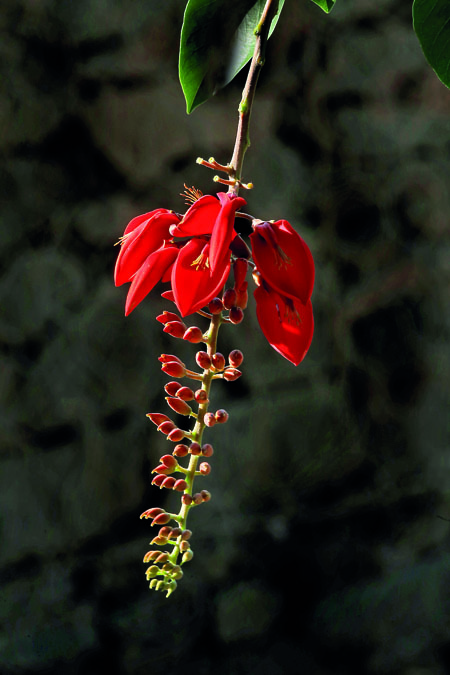 While our cover image this week depicts a similar species of this Avurudu flower, it is a close relative of the species of the true Katu Erabadu – Erythrina crista-galli – the actual Erabudu flower. The brilliant scarlet flowers of the true Katu Erabadu originally associated with the Avurudu season is a rare sight these days we are told. Elaborating on this phenomenon, Monica Wickramasinghe, Assistant Director, Gampaha Botanical Garden explained the reasons behind the scarcity of the majestic Katu Erabadu trees. “The trees were once used to make fences for gardens and crop lands due to its sharp thorns. Thereafter these thorny fences were replaced. In addition, the climatic changes of the environment have also played a part in affecting the natural growth cycle of the trees,” claimed Ms. Wickramasinghe. As traditions have evolved so too the planting of the Katu Erabadu we are told. Owing to small garden spaces and age-old beliefs of planting trees with thorns bringing bad luck, the Katu Erabadu trees are hardly grow in households anymore. The Katu Erabadu leaves itself are rich in medicinal value as well. The leaves are used to make herbal beverages (kola kanda) and kola mallung.